In the spirit of this blog, I want to focus on the 2 official statements on the case from Illinois’ Chancellor, Phyllis Wise, and its Board of Trustees. As efforts at damage control, they are on the one hand singular in their ineloquence and ineptitude. Yet on the other hand they are familiar in their abuse of notions like “civility,” “debate,” and “discourse”—especially when the latter are “robust,” a keyword forthcoming on this blog. What we cannot and will not tolerate at the University of Illinois are personal and disrespectful words or actions that demean and abuse either viewpoints themselves or those who express them. Viewpoints, of course, can’t be demeaned—nor is there any attempt to explain what constitutes “personal,” “disrespectful,” demeaning, or abusive words, much less the combination of all four, much less still the relationship between viewpoints and those that express them. Some of our faculty are critical of Israel, while others are strong supporters. These debates make us stronger as an institution and force advocates of all viewpoints to confront the arguments and perspectives offered by others. We are a university built on precisely this type of dialogue, discourse and debate. Note the redundant use of “dialogue, discourse and debate” here, in which all 3 are treated as identical concepts, their differences elided in the banal, alliterative evocation of intellectual life as imagined by bureaucrats—a sing-songy pantomime of actual thinking. Our campuses must be safe harbors where students and faculty from all backgrounds and cultures feel valued, respected and comfortable expressing their views…The University of Illinois must shape men and women who will contribute as citizens in a diverse and multi­cultural democracy. To succeed in this mission, we must constantly reinforce our expectation of a university community that values civility as much as scholarship. Disrespectful and demeaning speech that promotes malice is not an acceptable form of civil argument if we wish to ensure that students, faculty and staff are comfortable in a place of scholarship and education. If we educate a generation of students to believe otherwise, we will have jeopardized the very system that so many have made such great sacrifices to defend. The desire for civil discourse in mainstream politics conceals a deeper desire for a politics of consensus, with no major points of either ideological or practical disagreement. In this view, politics becomes simply a process of managing government bureaucracy; fundamental social conflicts do not exist, only rhetorical ones do. The other trouble with “civility” is that it is unclear what it means, or if it means anything. In the Salaita case, if his offense is anti-Semitism—a demonstrably untrue charge—than it should be enough for Wise to denounce him for that alone. Instead, as Brian Leiter writes in a piece on the Salaita affair, “incivility” seems here to simply mean bad manners—something nobody should want university administrators adjudicating, nor people losing their livelihoods over. Of course, these notions of civility (and again, Wise’s related four D’s—debate, discourse, diversity, and dialogue) as the glue holding campuses together are always summoned by administrators as rhetorical weapons against particularly troublesome campus dissenters. So on the simplest level, “civility” is merely an invention to discredit your opponent’s point of view as irrational. Given the word’s etymological links with “civilize” and “civilization,” this is a mode of attack with which Palestinians like Salaita are likely quite familiar. 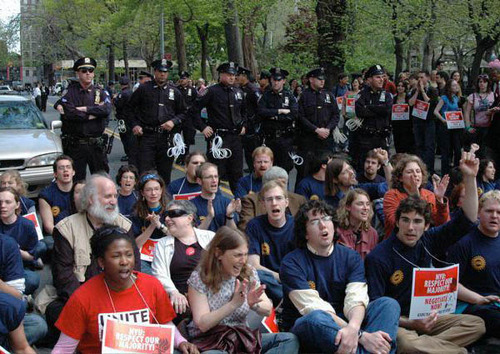 As a graduate student at NYU during a 2005-06 strike by the graduate employee union, we heard a lot of civility talk from university administrators who were hostile to graduate assistant unionization but were unwilling to honestly say why. NYU loved to intimate that our parent union, the UAW, would try to rewrite syllabi, that unionization would forever sully ties between faculty and students, that it was hostile to undergraduates. As with so many keywords beloved by university administrators— “innovation,” “entrepreneurship,” and so on—there is an opportunistic element of the sacred, or at least the sacrosanct, in these treatments of the university. Once administrators feel threatened, campuses become halls of peaceful contemplation, “safe harbors,” as the Illinois Board of Trustees puts it, from the tumult of the world outside. General, non-discipline-specific, boycott statement: 1402 and counting! Philosophy: 340. Email John Protevi at protevi@lsu.edu or add your name in a comment at this link. Political Science: 174. Email Joe Lowndes at jelowndes@gmail.com. English: 266. Email Elaine Freedgood at ef38@nyu.edu. Women’s/Gender/Feminist Studies: 54. Email Barbara Winslow atbwpurplewins@gmail.com. And if you’re not an academic but want to tell the UI to reinstate Salaita, you can sign this petition. More than 15,000 have.